Copyright 2007 SVJ Designs, LLC. All Rights Reserved. The Marquee > Search > Owner/Operator > Akin Ventures Inc. 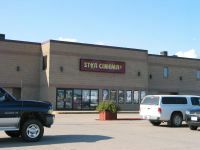 This movie theater is near Pr du Chien, Prairie du Chien, Mc Gregor (IA), Marquette (IA), Bagley.